Fifty years after Steve McQueen chased a 1968 Dodge Charger in a Dark Highland Green ’68 Mustang to the delight of gearhead movie fans, Ford is releasing its third special edition model to commemorate that iconic movie car. That movie was “Bullitt” and the 50th anniversary Bullitt Mustang is the most powerful yet. In fact, it turns up the wick on the Mustang GT. 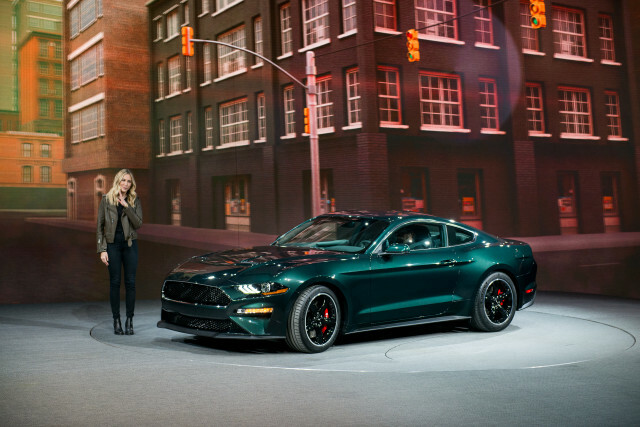 The limited-edition 2019 Mustang Bullitt’s 5.0-liter Coyote V-8 puts out 475 horsepower and 420 pound-feet of torque, a gain of 15 hp over the base Mustang GT. The extra power helps the Mustang coupe reach a top speed of 163 mph, 8 mph faster than the Mustang GT. The Bullitt Mustang is equipped with a 6-speed manual transmission, complete with a cue ball shift knob. To capture the burble of the movie car, it also gets an active valve performance exhaust system, with new Nitroplate black exhaust tips. Ford also uses the Shelby GT350’s intake manifold with larger throttle bodies, a new open air induction system, and a new calibration for the powertrain control module to not only get that sound, but to scratch out that extra power. The Bullitt is based on the GT Premium trim level and the Performance package comes standard. The Premium content is mostly comfort and convenience features, but the Performance package items tend to be go-fast goodies. Among those features are six-piston Brembo brakes, a unique front splitter and rear spoiler, a strut tower brace and K-brace, heavy duty front springs, a thicker rear sway bar, a Torsen differential with a 3.73 gear ratio, and a larger radiator. It also includes looser settings for the stability control system and ABS, an aluminum gauge panel, and a gauge pack. Also standard for the Bullitt are a heated, leather-wrapped steering wheel and a 12-inch digital gauge cluster with a special welcome screen that shows an image of the Bullitt Mustang instead of the iconic pony. Green stitching is used on the dashboard, door panels, center console, and seats. On the outside, buyers can choose from the classic Dark Highland Green paint or Shadow Black. They also get chrome accents around the front windows and the unique black grille, the requisite Torq Thrust-style 19-inch wheels, red-painted Brembo brake calipers, and a Bullitt logo on a circular faux gas cap. Bullitt buyers will have a choice of three options. They consist of the MagneRide magnetorheological dampers, black leather Recaro front seats, and the Bullitt Electronic package, which adds navigation, memory for the driver’s seat and mirrors, a premium sound system, and blind-spot monitors with rear cross-traffic alerts. The Bullitt Mustang is due this summer. Ford hasn’t given a price or said just how limited it is. For more news from Detroit, see our dedicated hub.